Dr. Faber, thanks so much for joining us again, and, how are you? Mike Gleason: Let's start out here with the equities Marc. Now the U.S. stock markets peaked in late January and made their lows for the year in early February. Stocks have been trading in a range since but are currently pushing back towards those lows as volatility has certainly picked up. If you had to guess about which way the markets are likely to break from here, what would it be, and do you think we've seen the top for 2018 or can speculators keep pushing the markets higher for a bit longer? 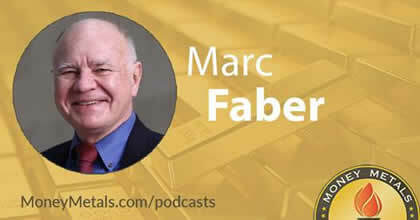 Mike Gleason: Dr. Faber, it seems to us that the fate of precious metals markets is tied pretty closely to stock prices, at least in the near term. We lack either fear or greed to drive any trend change. Here in the U.S. there's very little demand for safe-haven assets. If you look at sentiment in the metals markets, you'll find that the greed factor is also missing. Now that could all change if gold and silver can catch investors' attention by significantly outperforming stocks for a while longer or if we get the long overdue correction stocks. Marc Faber: My view is that, actually, the Trump administration, for which, I would have voted for Mr. Trump, but he proves every day that he's a completely clueless individual. He says one thing and then does something totally different. He changes his view all the time. And I think, quite frankly, there is a trade war which maybe won't happen, but if there is one, the U.S. will be the big loser, because consumer prices in the U.S. will go up and that is not desirable at the present time, as the Fed is already tightening, and interest rates have been rising, so what it will mean is, if there is a trade war, initially the dollar will actually rally. But this is precisely what the U.S. shouldn't have, a very strong dollar.